Fleetwood Mac's Stevie Nicks has told NME that she'd love to headline Glastonbury in 2013. Addressing rumours that the band could coincide a forthcoming summer 2013 tour with their debut appearance headlining the Pyramid Stage, Nicks says she watched Beyonce's performance at the festival in 2011 from her hotel room in London after her own slot at Hyde Park Calling that year. "When we were there [in the UK] in 2011, I watched it. I watched Beyonce and it was pretty amazing! I had just got home from the Hyde Park thing, so I was just home from my own show and I turned on the TV and we had a pretty big screen in the hotel where we were, so I sat and watched like three hours, four hours of it, so would I love to do it? I’d Love to do it!" Speaking about the band's forthcoming world tour, she added: "We are coming to the UK. It’s on there, the pre-schedule that they start sending out to you. We have basically 50 shows in the United States and then a little break, then It looks like we are coming to England to do, probably like seven or eight shows. I don’t know that for sure, but I think that’s what it will work out to be, and hopefully we will do other shows through Europe. I’m delighted to come over there, I’m thrilled about it." When asked if one of those shows could be Glastonbury, Nicks replied: "Oh yeah! I hope, you know, I hope I hope!" Previously, festival boss Emily Eavis admitted to NME that she would love to see Fleetwood Mac headline the Pyramid Stage in 2013. 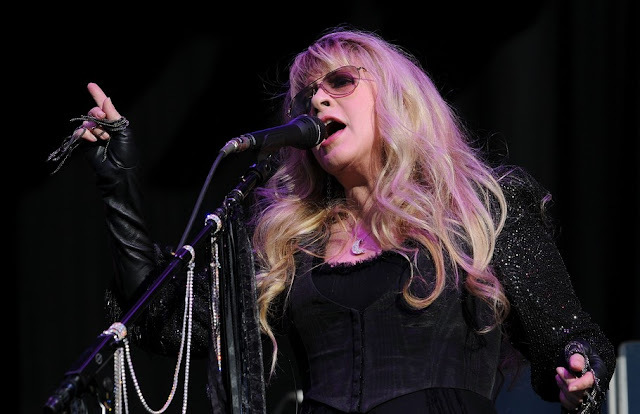 "I think Fleetwood Mac would be amazing to get," she said in October of this year. "I’ll be totally honest we haven’t had any conversations with them yet but, you know, it is still early days. We’re just talking to some headliners now. For us it’s about getting the balance of heritage bands, legends and new bands – just keeping that balance."